I've always "hated" abstract art. Not abstract painting but the art in which it seems like somebody just dumped over a trash bin and slapped a title on it and said "Hey this is art." I always assumed that it was lazy and self-serving: "What is the artist thinking? Nobody else is going to enjoy this." My artistic hubris never allowed me to see beyond the practical expressions of art that I so comfortably gravitate towards. ...drew a picture, rubbed it out, and felt silly. Something was subtracted, but nobody cared. Rauschenberg wasn't important, not yet, and erasing a Nobody's something was not like erasing a Somebody's something, and that's when he decided he would do a totally crazy thing; he would go, with no invitation, to the hottest, most successful artist in the city and ask him to hand over a drawing that would automatically have artistic (and commercial) value, and tell him, "I want to erase what you give me. That's how I will create empty. "These I would miss. I like them." But then, as before, he dropped them back into their folder. "No," he said, "I want it to be very hard to erase; I'm going to make it so hard for you to erase this." De Kooning gave Rauschenberg a cherished charcoal drawing and Rauschenberg took the next 2 months to erase the piece. Now as both men are dead, no one in the world knows what the original piece was. I was pleasantly shocked by the level of discomfort Rauschenberg's Erased De Kooning gave me. There was a pang in my gut. Aaaahh... YOUR NOT SUPPOSED TO DO THAT. Art is sacred and you don't delete art. I'm a bit of a sentimental hoarder. Anything artist / creative to the slightest degree, I hold onto. I have journals, notebooks, scribbled drawings, pictures, and videos that sit untouched and undesired in boxes or folders on my computer. I have an aching desire to just burn it all and be rid of the clutter. However, there is another part of me that cannot. Something feels sacrilegious to me about destroying any semblance of a creative work. I don't think that I am the only person that holds such an emotional attachment to creative works. That's why it pains me to think that there was something beautiful here that has been completely wiped from human existence except for in the minds of these two dead men. Historically, I would have stopped at that pain and said "this is stupid." Now I recognize that Rauschenberg's piece has made me feel deeply. The pang of regret and loss over something I would never have known is Rauschenberg's gift. There was suffering in his work; De Kooning made sure of that. And that suffering has created something that asks questions: What was there before? 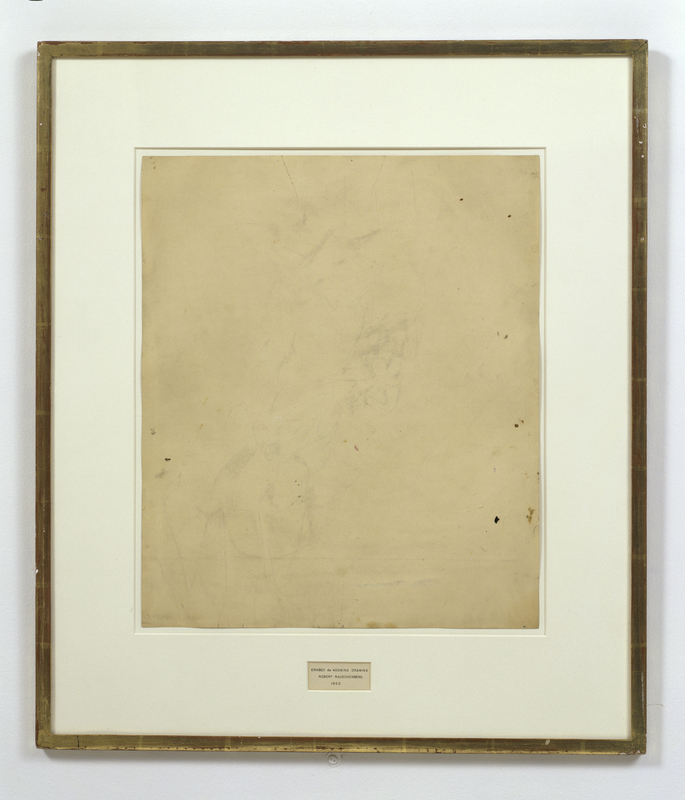 Why did Rauschenberg erase it? What am I holding onto in my life that I ought to erase? The purpose of art is not always to entertain or please us aesthetically as I've immaturely thought. No. Art is to supposed "comfort the disturbed and disturb the comfortable." This piece made very uncomfortable.